Through the years I've grown in self-awareness and understanding. I believe it is good, wise, and honorable to know your strengths and weaknesses so you can better serve God and love people. For example, how can I love people in the way they need love if I'm not aware that I can be an 'energetic' nurturer? (Some say smother, but I say mother.) Or if I am unaware of the intensity of my faith, maybe I sound like a raving lunatic instead of a compassionate, bold Jesus-follower? Knowing who we are and what we believe increases our ability to love and serve. However, a main point of contention I have with those who seek self-help, self-improvement, and even self-awareness is what or who is your plumb line? If I only grow and measure myself against myself, my awareness is nebulous and/or self-serving. If I grow and measure myself against others then I always succeed or always fail, and the measurements result in self-gratification or self-loathing. Theology, the study of the nature of God, is the answer. In the last 20 years, I've surrendered to the fact that knowing who God is enables me to know who I am. His grace to us tells us in his Word that we are fearfully and wonderfully made, that he will complete the good work he started in us, and that he is transforming us into his very image. Whether we seek to know what this means or not, he will work in us because he is faithful and he doesn't break his promises. But, if the Creator of the universe is changing you into his image, don't you think it would help to know who he is? Hence, theology. Here's the truth, friends. I'm not an intellectual. But, I am a learner, child-like when I get excited about a new to me concept, and a reader (a slow reader, but a reader nonetheless.) I am not someone who can sit around and debate theology. Heck, I can't really debate anything. I feel deeply about God, life, and love. I can most certainly tell you what I believe and why I believe it. However, I continue to need help in learning deep truths about God in my head and heart. I've read quite a few theology books all the while weighing what I'm learning with scripture and talking them out with Chad and friends. Good theology books will be full of scripture, and not just one off verses to support their claims. I'm continually on the search for strong-willed, intelligent, fierce women who love God and his word. You all know I love Beth Moore. I recently finished Entrusted, her study on 2 Timothy and it blew my mind. If you choose to do this study, please, please go through the video teachings, too. Many of you also know mentoring relationships for women in Second Mile begin with Wendy Alsup's book Practical Theology for Women. (I have copies in my office if you'd like to buy one.) I read her blog regularly. The woman knows her Bible. "If you had told me five years ago that I would one day write a book for Christian women that led off with a quote from Proverbs 31, I probably would have punched you in the face." Doesn't that sound like someone who could be my bestie? 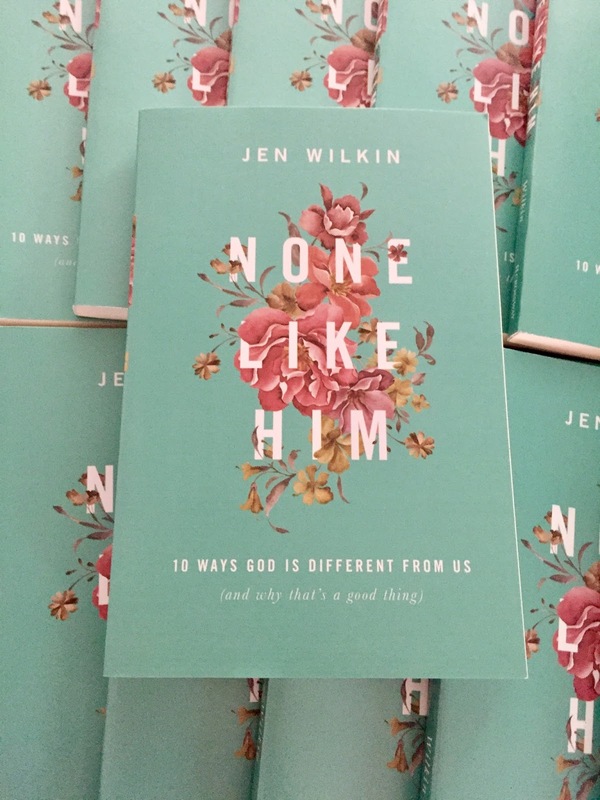 In the book, Jen describes ten attributes that only belong to God and shows how we humans seek to mimic these attributes. I'm reading this book slowly, devotional style, so I can take it all in. As I read each chapter, my awe of who he is increases and my own conviction grows as I see how I try to put myself in his place. Do you want to truly know yourself? Then get to know God! Do you want to find comfort in his magnificence? Then know how to name these attributes and what they actually mean! I had no idea how much I would love this book, but I certainly do. Also, it's super easy to read so that's a bonus. Jen takes deep concepts and writes about them in a way that isn't alienating and/or frustrating. This book is for everyone. Men, it's for you, too. I recently read a comment by a pastor who is taking his whole staff through it. Jen also had this to say about a different book she wrote, but it applies here, as well: "FAQ: "Is there a book like Women of the Word aimed at men?" Not that I'm aware, but the concepts aren't "pink". Just rip off the cover, bro." Wisdom and sass make me so happy. I would love for many of us to be mulling over these ten characteristics that only belong to our great God. It will deepen our faith which will deepen our conversations which will deepen our relationships which will deepen our church which will deepen our desire to talk about him to people who don't yet know him. Beautiful. To make things interesting I'm going to do a little giveaway. Leave a comment below with a chance to win a copy of this book AND a $30 gift card to Amazon. Obviously, if you win I don't want you to use the $30 on a new swimsuit or cardamom, but I can't control your purchases. Just remember, I love books. I can easily recommend ways for you to spend $30 on great books if you don't know where to start. Leave a comment and I'll choose a winner in a week or so. Let's spend the upcoming summer slowing down a bit, reading a good book or two, and getting to know God more and more so he can show us who we are in him. Self-awareness at it's finest. 23 important comments so far. What are your thoughts? Angel I didn't know you had a blog. Diffently adding you to my reading this. Great insight. Thank you for sharing. Jen Wilkins is amazing. Love how God is using the women in our time for discipleship and leading in our gospel communities. I'm excited to dig into this book (either by winning it ;), or buying it) this summer. Thank you for sharing seeds of wisdom you have found along your journey. I love being spurred on by godly women in Second Mile. I also really enjoy and respect Jen Wilkin! This book is at the top of my list and I can't wait to read it! Maybe it's the light at the end of the tunnel with grad school, or just settling more into my 30's but reading these women's perspectives on Jesus has been so refreshing for my sometimes exhausted body. Thanks for sharing this book. I've never read Jen Wilkin but will definitely add it to my reading list on your recommendation. I love your blog, Angel! You always inspire & encourage me plus cause me to really think about many of the topics you address. I'm so proud of the woman you have become. May God continue to bless your ministry. She does sound like she could be your bestie! :) I respect you so much for your desire to continue to grow as a person, rooted in and going deeper with God. Thanks for being an ever encouragement to me. I just bought her book on how to study the word. I am really excited to get some practical tips to increase my biblical literacy and understanding of Jesus. I am excited to read this book as well, my book pile is getting very large. Thank you for sharing! This could be so cool to do as an entire community group (men could rip off covers ;)) or to do as ladies. Thank you for your vulnerability and for your intensity of faith and deep mothering! I hadn't heard about Jen Wilkin until you posted something about this book a little while ago. Your recommendation is all I need to jump right in. I appreciate your description of a cycle of deepening because it emphasizes that being prepared through the experiential knowledge of God and his Word isn't disjoint from telling others about Him. I've been mulling over this concept a lot lately - how our identity is wholly in Christ, we know who we are (and who we are not) because of who He is, and how community affirms both of those identities. I started writing a loose (ha. reaaaally loose) Bible study for our group since this is at the heart of what college students are learning, but maybe I'll just invest in this book instead. Thanks for pointing us to hearty sources that challenge our minds and souls! You know I'm always up for a good book recommended by you! Like others in this comment string, I've been thinking about identity (for me about the last year or so) more intentionally. John 15:5 has been an anchor verse in my life and it has expanded in its meaning as it relates to identity--apart from Christ I am nothing. I am my true self, the person God uniquely designed me to be, when (and only when) I am abiding in Christ. Would definitely be interested in reading this book, whether I win it or not. Jenna, don't you dare stop writing your bible study! That's awesome! Thanks for sharing, Angel! I've definitely been looking for the next thing to work/study through and the concept of leaning even more of God's character has been what I've been seeking. OK, this book is NO JOKE. I take Angel's recommendations for books very seriously because so far she has never lead me astray. I was excited to do this book with the older youth girls because it has deep, rich wisdom that can be understood at every level. This book is if you are a new believer, an old believer, a believer who needs a kick in the pants, and a believer who wants to be grafted into Jesus and His Mission. I also am reading "Everyone's Normal Till You Get To Know Them" and I think these books parallel each other so beautifully. Both are teaching me (sometimes more like hitting my upside my thick skull) that I need to get over myself. It's not about me. It's about loving JESUS and loving PEOPLE. That's where community comes from, that's where worldly change comes from, that's where everything can come from. So, if you are like me and need A WHOLE LESS SELF then pick up this book and study it with friends who can help you identify areas to grow in. Love love love so much! As I've wrested with seeing myself how Christ sees me and becoming the person He has made me to be, books like this are breathes of fresh air for my heart. Thank you for continually pointing the women of second mile towards Christ above all else. A chance to win a book on my Amazon list and $30 to spend on more books? Yes! Count me in! Women of the Word was a game-changer for me. I have greatly appreciated Jen Wilkin's maturity and faithfulness to the Word of God. She stands as a light of truth for women in a sea of superficiality. Thanks for sharing, Angel!